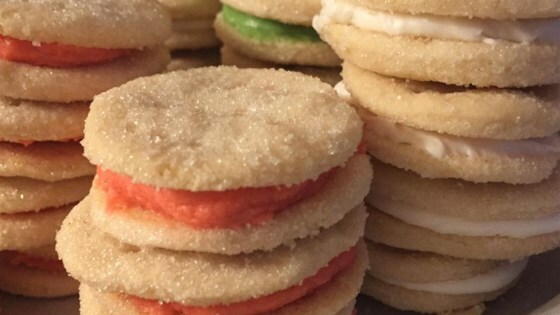 "These are crisp and puffy sandwich cookies. The filling can be colored to match any occasion." Combine the 1 cup butter, cream and sifted flour. Mix well and chill for at least 1 hour. On a floured board, roll out 1/3 of the dough to 1/8 inch thick. Cut with 1 1/2 inch round cookie cutter. Transfer rounds to waxed paper heavily covered with white sugar. Turn rounds so that both sides are coated with sugar. Place rounds on ungreased baking sheets and prick each round with a fork about 4 times. Repeat with remaining dough. Bake at 375 degrees F (190 degrees C) for 7 to 9 minutes. Let cookies cool then put 2 cookies together with the filling. To Make Filling: Blend the remaining 1/4 cup of butter, the confectioners' sugar, egg yolk and vanilla together. Tint with food coloring, if desired. You may double the filling for a nicer looking cookie. The cookie seems a little bit too sweet. It a also takes a lot of time to bake it. Overall, it is a pretty good cookie.